Life outside of the lab for Dan is filled with family, music, and games. He plays the guitar, while his son and wife play the piano and oboe, respectively. One of their favorite games to play together at the moment is Carcassonne. Dan is a materials engineer by training. As a materials engineer, he is interested in determining what materials are optimal for different applications, as well as creating materials that can survive and perform under different conditions. In particular, Dan’s research investigates the microstructure of materials. This microstructure lies on the scale between the nanostructure (atomic level) and the macrostructure (centimeters or more). There are a lot of things they can do when processing materials that can change the microstructure, and these changes affect the properties of the material. In addition to inspiration gained from figures like Carl Sagan and Mr. Wizard, Dan was encouraged to pursue science and engineering by counselors and passionate teachers during middle school and high school. As a college student, Dan had an engineering professor who engaged the class in hands-on activities to better understand materials science, and these demonstrations left Dan absolutely captivated. At that moment he decided to become a materials engineer. Dan’s enthusiasm for teaching dates back to his days as a teenager when he taught guitar lessons. It was amazing to be able to help someone suddenly be able to do something they couldn’t do moments before. 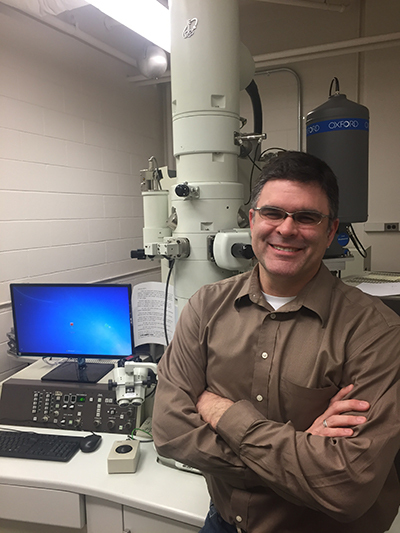 Combining his love of materials science and teaching put Dan on track for a career as a faculty member in materials engineering. Patience and resilience are lessons that scientists have to learn over time. A few years ago, another researcher published work that Dan had considered pursuing several years before but never completed. Rather than becoming frustrated and giving up when one of his potential research lines was taken by someone else, Dan viewed this as a validation that maybe some of his ideas were good enough for others to want to work on as well. He knew he had other ideas and that if another one failed or came to fruition in another lab, there were still others on which he could work. A few years ago, Dan was working on a materials science project on grain growth within materials. Grain growth is basically the evolution of the microstructure of a material. They worked out a solution to a geometric problem to determine whether a grain was growing or shrinking. The result was a number that represented the geometric average of the properties of the idealized grain. In that moment when the number emerged, it felt like everything clicked and things started to make sense. This was a phenomenal feeling, and these eureka moments are what researchers chase every day. One of Dan’s favorite places to travel for science is the South of France. He was there not long ago for a meeting on interfaces within the microstructure of materials and how these interfaces behave under certain conditions. While there, Dan enjoyed the beautiful harbor and had time to think critically about what he was doing in the lab and why. There was also time allotted in the meeting for attendees to go for walks and hikes which led to great discussions with other researchers. Dan generated a lot of excellent ideas in just a few days and came back to the lab super-charged and ready to dive back into his research. In Dan’s lab, they have a tradition that was started by one of his students a few years ago where time is informally spent on Fridays building small pieces of equipment needed to do particular jobs in the lab. Typically these pieces of equipment would be prohibitively expensive to buy commercially, but they have made fully functional versions much less expensively to get the job done. One Build-It-Friday invention called a ball mill would have cost a few thousand dollars to purchase, but the students built one that cost only about $50, and it increased productivity by six times over the commercial model! Everyone is on their own timeline. Your path is your path and yours alone, so try to avoid comparing yourself to others. Keep asking questions, and keep learning new things. Also, fail early, and fail often. If you don’t fail, you’re not trying hard enough. Getting it wrong is the first step to getting it right. Dan’s current research interests include nanotechnology, thermodynamics, nanomaterials, computational modeling, fuel cells, and energy systems. Prior to joining Rensselaer, Dan was a researcher at GE Global Research. His work focused on oxidation performance and deformation processing of advanced ferritic materials for SOFC interconnects. In addition, Dan studied the metallurgy and electrical properties of amorphous and nano-crystalline soft magnetic materials, oxidation resistant coatings for superalloys, and infrared heating technology development. Before joining GE Global Research, Dan was awarded a two-year National Research Council post-doctoral fellowship. Under this award, he worked at the National Institute of Standards and Technology (NIST) to study eutectic solidification microstructures using experimental and computational techniques. While at NIST, he co-developed a technique for quantifying solidification microstructures in ternary eutectics. He also studied the effect of solidification velocity on the phase distribution in low-volume fraction ternary eutectics containing intermetallic phases. His computational work involved constructing multi-phase field models for predicting eutectic morphology through lamellar fault motion, phase instabilities, and branching phenomena.